C# is a strongly-typed language. Every variable and constant has a type, as does every expression that evaluates to a value. Every method signature specifies a type for each input parameter and for the return value. The .NET class library defines a set of built-in numeric types as well as more complex types that represent a wide variety of logical constructs, such as the file system, network connections, collections and arrays of objects, and dates. A typical C# program uses types from the class library as well as user-defined types that model the concepts that are specific to the program's problem domain. The storage space that a variable of the type requires. The maximum and minimum values that it can represent. The members (methods, fields, events, and so on) that it contains. The base type it inherits from. The location where the memory for variables will be allocated at run time. The kinds of operations that are permitted. // Error. Operator '+' cannot be applied to operands of type 'int' and 'bool'. C and C++ developers, notice that in C#, bool is not convertible to int. The compiler embeds the type information into the executable file as metadata. The common language runtime (CLR) uses that metadata at run time to further guarantee type safety when it allocates and reclaims memory. After a variable is declared, it cannot be re-declared with a new type, and it cannot be assigned a value that is not compatible with its declared type. For example, you cannot declare an int and then assign it a Boolean value of true. However, values can be converted to other types, for example when they are assigned to new variables or passed as method arguments. A type conversion that does not cause data loss is performed automatically by the compiler. A conversion that might cause data loss requires a cast in the source code. For more information, see Casting and Type Conversions. C# provides a standard set of built-in numeric types to represent integers, floating point values, Boolean expressions, text characters, decimal values, and other types of data. There are also built-in string and object types. These are available for you to use in any C# program. For more information about the built-in types, see Reference Tables for Types. You use the struct, class, interface, and enum constructs to create your own custom types. The .NET class library itself is a collection of custom types provided by Microsoft that you can use in your own applications. By default, the most frequently used types in the class library are available in any C# program. Others become available only when you explicitly add a project reference to the assembly in which they are defined. After the compiler has a reference to the assembly, you can declare variables (and constants) of the types declared in that assembly in source code. For more information, see .NET Class Library. It supports the principle of inheritance. Types can derive from other types, called base types. The derived type inherits (with some restrictions) the methods, properties, and other members of the base type. The base type can in turn derive from some other type, in which case the derived type inherits the members of both base types in its inheritance hierarchy. All types, including built-in numeric types such as System.Int32 (C# keyword: int), derive ultimately from a single base type, which is System.Object (C# keyword: object). This unified type hierarchy is called the Common Type System (CTS). For more information about inheritance in C#, see Inheritance. Each type in the CTS is defined as either a value type or a reference type. This includes all custom types in the .NET class library and also your own user-defined types. Types that you define by using the struct keyword are value types; all the built-in numeric types are structs. Types that you define by using the class keyword are reference types. Reference types and value types have different compile-time rules, and different run-time behavior. The following illustration shows the relationship between value types and reference types in the CTS. You can see that the most commonly used types are all organized in the System namespace. However, the namespace in which a type is contained has no relation to whether it is a value type or reference type. Value types derive from System.ValueType, which derives from System.Object. Types that derive from System.ValueType have special behavior in the CLR. Value type variables directly contain their values, which means that the memory is allocated inline in whatever context the variable is declared. There is no separate heap allocation or garbage collection overhead for value-type variables. There are two categories of value types: struct and enum. // Static method on type byte. Value types are sealed, which means, for example, that you cannot derive a type from System.Int32, and you cannot define a struct to inherit from any user-defined class or struct because a struct can only inherit from System.ValueType. However, a struct can implement one or more interfaces. You can cast a struct type to any interface type that it implements; this causes a boxing operation to wrap the struct inside a reference type object on the managed heap. Boxing operations occur when you pass a value type to a method that takes a System.Object or any interface type as an input parameter. For more information, see Boxing and Unboxing. For more information about structs, see Structs. For more information about value types in .NET, see Value Types. The System.IO.FileMode.Create constant has a value of 2. However, the name is much more meaningful for humans reading the source code, and for that reason it is better to use enumerations instead of constant literal numbers. For more information, see System.IO.FileMode. 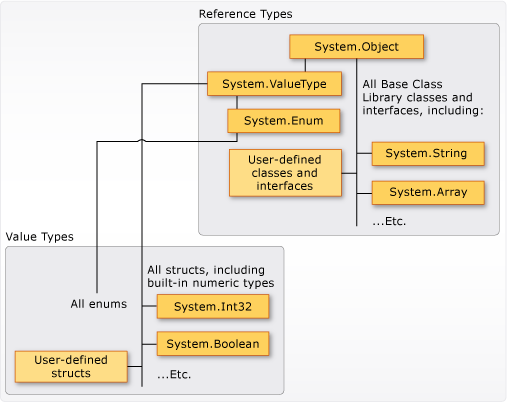 All enums inherit from System.Enum, which inherits from System.ValueType. All the rules that apply to structs also apply to enums. For more information about enums, see Enumeration Types. When the object is created, the memory is allocated on the managed heap, and the variable holds only a reference to the location of the object. Types on the managed heap require overhead both when they are allocated and when they are reclaimed by the automatic memory management functionality of the CLR, which is known as garbage collection. However, garbage collection is also highly optimized, and in most scenarios it does not create a performance issue. For more information about garbage collection, see Automatic Memory Management. // Declare and initialize an array of integers. // Access an instance property of System.Array. Reference types fully support inheritance. When you create a class, you can inherit from any other interface or class that is not defined as sealed, and other classes can inherit from your class and override your virtual methods. For more information about how to create your own classes, see Classes and Structs. For more information about inheritance and virtual methods, see Inheritance. In C#, literal values receive a type from the compiler. You can specify how a numeric literal should be typed by appending a letter to the end of the number. For example, to specify that the value 4.56 should be treated as a float, append an "f" or "F" after the number: 4.56f. If no letter is appended, the compiler will infer a type for the literal. For more information about which types can be specified with letter suffixes, see the reference pages for individual types in Value Types. // Outputs: "The answer is 5"
The use of the type parameter makes it possible to reuse the same class to hold any type of element, without having to convert each element to object. Generic collection classes are called strongly-typed collections because the compiler knows the specific type of the collection's elements and can raise an error at compile-time if, for example, you try to add an integer to the stringList object in the previous example. For more information, see Generics. As stated previously, you can implicitly type a local variable (but not class members) by using the var keyword. The variable still receives a type at compile time, but the type is provided by the compiler. For more information, see Implicitly Typed Local Variables. In some cases, it is inconvenient to create a named type for simple sets of related values that you do not intend to store or pass outside method boundaries. You can create anonymous types for this purpose. For more information, see Anonymous Types. Ordinary value types cannot have a value of null. However, you can create nullable value types by affixing a ? after the type. For example, int? is an int type that can also have the value null. In the CTS, nullable types are instances of the generic struct type System.Nullable<T>. Nullable types are especially useful when you are passing data to and from databases in which numeric values might be null. For more information, see Nullable Types.